Mate is more than just good for the body; it's good for the soul. Drinking it can be a form of meditation or reflection - allowing the goodness to infuse into the body while stimulating and resting the mind. But this wholeness does not always happen alone. 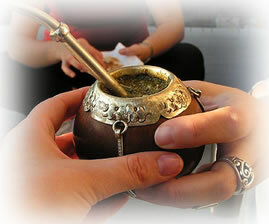 In traditional Mate use, the cup is often shared among close friends and family - using the same straw, or bombilla. Reminiscent of the kind of closeness written about in Robert Heinlein's "Stranger in a Strange Land," where the characters become "water brothers" or "water sisters" when they drank from the same cup one after the other, those who share the Mate cup join in a kind of bond where the sharing of the health and meditation of the Yerba Mate is a sign of total acceptance and friendship. "When One Offers Mate, He Offers Friendship"
In Argentina and Brazil, fellow gouchos or farmers, knit together by the work of taming a wild land, will share a Mate around the camp fire to enhance their bonds of companionship. In Buenos Aires it's common to find a close-knit family or two lovers, or two or three best friends sharing a Mate on an outing to a local park or beach. In all these places, when an individual or group finally offers to include you in their Mate sharing, it should be taken as the highest possible compliment and entered in to with great appreciation. To avoid offending the offering party, there are a few rules you should follow as a part of a Mate fellowship. In a traditional Mate sharing event, there is one person who pours the hot water and serves up the cup. At a party of close friends, this person is often the host. At outings or at home, this responsibility may change from one sharing to the next. Generally the server will start a new infusion and then take the first drink. He or she will drink all the water in the Mate cup, taking several good sips until air is heard coming through the bombilla. Once done, the server will again fill the cup with hot water and hand it to the next drinker, who will also drink the entire contents of the cup before handing it back to the server. The cup will once again be filled and handed to the next person, who does the same. This process will continue, going around the circle many times, until there is no flavor left in the infusion. Some may worry that such an intimate sharing is unsanitary. It probably is, but no more than kissing. It is precisely this fact that makes sharing the Mate into such an intense friendship event. You don't share it with the casual friend. You share it with those with whom you would share your soul. Mate friendships are the best kind of friendships to have.